A ritual has come to an end and I am searching once more for that perfect cup of coffee. For the last couple of years I have been getting up just a little earlier on Sunday mornings and driving to a Starbuck’s twenty minutes down the road. I listen to “Breakfast with the Beatles” – a radio show that features obscure tracks and interviews about -arguably- the world’s most famous and influential band. I make this sojourn on Sundays even though there is a Starbuck’s half that distance from my home. I look forward to my Sundays with John, Paul, George and Ringo. The coffee is nice too. The real treat, though, is Fred -a barista that rarely makes a latte- but has made it his business to know every person that walks through the door, or at least to act like he does. The barista is in his sixties. Tall, grey-haired and full of wit and charm and wisdom, Fred greets everyone in line like they are old friends, and this personal touch is unique in a world of restaurant clones and corporate coffee houses. And people come to see him. The modern Socrates is not sitting on a rock outside the Acropolis, he is serving up hot coffee and a healthy dose of good will to an over-caffeinated generation of consumers slowly coming to the realization that when everything looks the same, acts the same, and tastes exactly the same – we begin to lose our individualities. Fred has been returning them one order at a time. Standing in line you can learn a lot about the other people that come to this coffee shop. Fred likes to talk and inquires about family, careers and interests. He remembers a little something about everyone. He looks people in the eyes and his smile is warm and sincere and genuine. Conversations are started, introductions are made, and friendships begin. It takes a little longer to get through the line, but no one seems to mind. This is why they came. When I make it to the counter Fred will loudly proclaim, “This man is a Saint. He has three girls. Three!!! I tell him, ‘don’t go out to dinner tonight.’ Every time he and his wife go out to dinner they have another baby.” People smile. I smile. His version isn’t that far from the truth. But it isn’t that hard living in a house full of women. I like it. 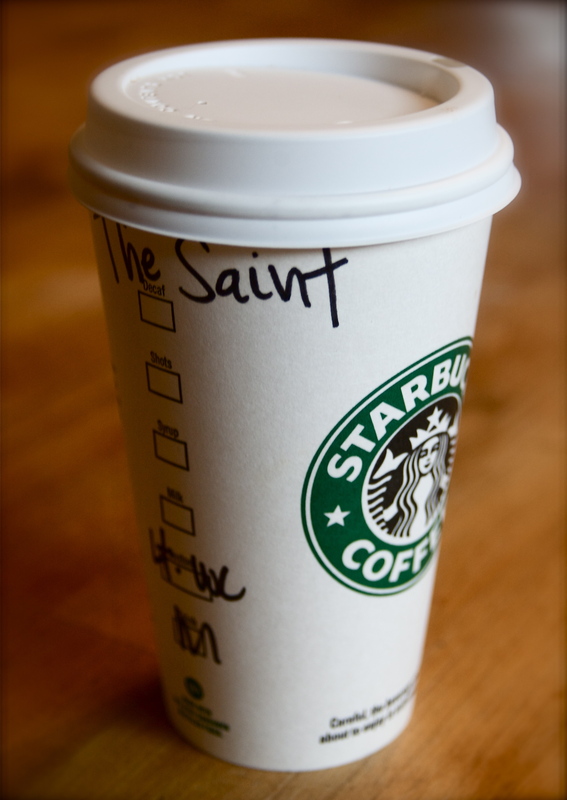 The barista grabs the black sharpie and carefully inscribes the words “The Saint” on the cup that will hold my lite-whip mocha. He asks about my wife and kids, or how many papers I will be grading this morning -or inquires about the book tucked under my arm. He talks openly about what I do for a living. Questions are asked, conversations started, hands shaken. Frequently, I don’t get anything done, and that’s OK too. I’m no Saint, but I get to be one Sunday mornings and it feels pretty good. Sometimes Fred walks over to my chair in the corner of the room and shares a few private words and friendship. Sometimes he will offer me a ceramic mug for my coffee. He talks candidly about his wife and children and I like to hear him talk. Last Sunday began like any other as I made my way down an empty freeway listening to studio out-takes from an early Beatles recording session. I had been in San Francisco for a conference and had missed this Sunday morning ritual the past couple of weeks. When I arrived, I noticed immediately that Fred wasn’t there. “Fred moved to Oregon to be with his family,” I was told as I paid for my coffee. “Friday was his last day.” The girl’s expression indicated quite clearly that this wasn’t the first time she had been asked the question. The place suddenly seemed different. I took the coffee and left. I would like to have said goodbye. It seemed important to me and a week later it still does. Fred didn’t change my life – he just made it a little nicer all those Sunday mornings. I wish I could have told him that. In the land of restaurant chains and corporate coffee houses it is getting increasingly difficult to tell one place or town from another. Everything looks the same and when you see one business on a street corner it isn’t hard to guess which competitor will be camped across the street. This familiarity breeds contempt and this contempt has infected the way see and relate to each other. The unique is overwhelmed by the mundane. It wasn’t always like this and it was Fred the Barista that reminded me of this truth. This man did something for a lot of people. And when you think about it, it shouldn’t be all that hard to do. Fred took a corporate concept and made it his own. He put the personality back into it. That small town awareness that people need to be seen as individuals – and known for who they really are. We think this is a talent -a gift. It isn’t. The sad truth is that a guy like Fred should have his own place, but Fred’s Coffee Shop can’t compete in the world today and wouldn’t last very long. Maybe I’m wrong. I hope I am. They were singing, nostalgically, about a place and time that may not exist anymore. But now it’s in my ears and in my eyes. Thanks for that, Fred. This cup is for you . . .
A foggy night in Tranquillity, dark and cold. I drive the car slowly down James Road as we begin the driving lesson. I am 16 years old and have never driven in such dense fog. I can barely see past the hood of the car and the thick mist seems to swirl around me. I keep my eyes focused on the dotted line just outside the path of the car’s headlights. I watch the road carefully, anticipating the sudden appearance of another car’s tail lights. I am tense and more than a little scared. 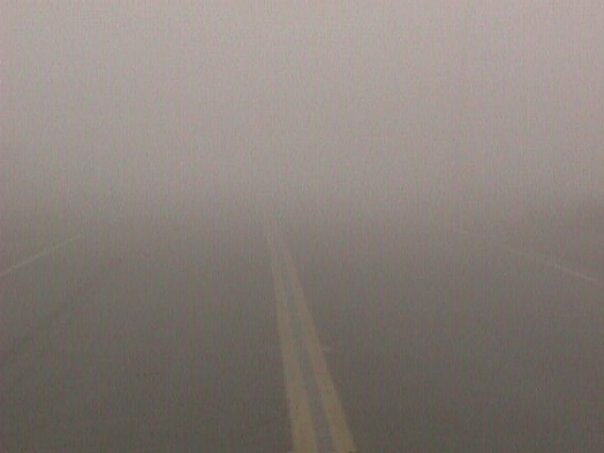 Driving in the fog is dangerous – more so at night. The sense of speed and distance and space are greatly distorted. This particular lesson, however dangerous, is a necessity. The tule fog comes quickly in the San Joaquin Valley. Lives are lost in the fog, and my father wants me to be prepared. As a teacher, I can say my father’s methods of instruction were harsh – some times cruel. They were equally effective. If I failed to give a full hard look to the right or left, he would wait until I pulled into the intersection, then slam his fist against the dashboard of the car shouting, “You just killed the family! The whole family! Your mother is dead! Your sisters are dead! They are all dead!” Conveniently, only he remained to rebuke me. I would, many times, return home in tears. I silently cursed him and openly declared that I would never get in the car with him again, though I always did. Ironically, the two major accidents I have been in were both with my father. And he was driving. I have to say that neither were his fault, and he handled both admirably. I guess there is a lesson there, too. Sometimes we collide with other people. Frequently, they run into us. My driving lessons began on weekends, trips usually to and from the county dump. I would help load the back of the truck and as a reward, I was allowed to drive. When I got my driver’s license I was allowed to go to the dump alone, and this was my first real taste of freedom. A young man with a car rarely feels the weight of that responsibility. He feels power and possibility. Parents, understandably, lament this. A young man behind the wheel of a car can be dangerous. And while he is the sum of everything he has been taught, some are taught better than others. What every parent knows, at least on some level, is that the young man at this point isn’t just driving the family car -he is now driving his life. Some are adept at avoiding collisions. They anticipate them. Others will inevitably cause them. On that particular night, driving through the fog, my father seemed unusually calm. I remember his face, lit by the glowing dashboard. He gave me lots of advice as we drove, all of it good and intent on my preservation. Two or three miles from home he had me pull way off the road. We were going to turn around and head home. But first, a question: “The fog is pretty thick, isn’t it?” he asks. I tell him it is some of the worst I have seen in a while. He nods his head in agreement, then asks me to get out of the car as he opens his own door. We stand in the cold fog as the car idles. “Look up,” my father says. I do, and I see the sparkling night sky above, bright and clear. It is as if the clouds have come down from the heavens to crawl for a time along the crust of creation. On the ground, I cannot see five yards in front of me, but the sky above is strikingly clear -and beautiful. We return home that night, safely and peacefully. The image of that night sky impressed upon my mind. Years later, I take my oldest daughter, Madeline, to school before I go to work. I have a late class on Fridays. We listen to the Beatles, mostly. Maddy likes Octopus’s Garden. I tell her stories about an octopus I once knew, and the impressive garden of shells he built around the glass mason jar he once lived in. He was curious and intelligent and once crawled out of his jar and onto my hand. She asks if I will take her scuba diving one day when she is older. I promise her I will. She is brave -an intelligent dreamer- and kind. There are kisses and wishes and she is quickly gone inside the school. I find a news station on the radio. This morning an atheist debates a Christian pastor on the existence of God. It is the usual collision between Faith and Reason. As I drive down the road I realize that, like the pastor, the Atheist’s purpose in life is also defined by the concept of God. For a man who does not believe, he is inordinately fixated on God. He is invested in the belief that there is no plan or divine intention in life. Listening to the conversation, I could not discern why this was so important to him. I wanted to know why. I sit in the play area at the Chandler Mall in Arizona watching my youngest daughters, Abby and Katie, chase each other up and down the slide. The mall is quiet in the early hours before regular business. Young mothers and older couples walk briskly down the upper and lower levels for exercise. There are friendly nods, smiles, and interest in the children. My mind wanders between the kids and the conversation I heard on the radio. I am disturbed at the Atheist’s need to prove that God does not exist. It was intensely important to him. It isn’t the disbelief that bothers me, though. It is the need for others to disbelieve, and the contempt he holds for those that hold passionately to their own faith. It was intensely important to him to subvert this. There is an element of rebellion and contempt in each of his answers and I have felt this kind of attack personally. An atheist I once knew told me I believed in “fairytales.” I respected his beliefs, but his lack of respect for mine disturbed and even angered me. It was mean-spirited and unnecessary. It was openly contemptuous and disrespectful coming from one claiming to be enlightened. I guess this is what disturbed me most about the conversation on the radio. He is like a driver intent on a collision. Katie and Abby compete for my attention with smiles and acrobatics. Diapers are changed and diapered butts run off to play. The questions on God lead to other thoughts about my life and choices. I think about work and marriage and the bills I have to pay and fatherhood and a million more responsibilities that drive me daily. There doesn’t seem to be enough time and the pressures of life sometimes feel like . . . well, like a fog surrounding me, obscuring what should be simple and obvious. I lean back in my seat and notice for the first time the clean bright morning light streaming through the skylights over the children’s play area. I never noticed them before – not in all the years we have been coming here. The sky is deep blue and clear and perfect, just as it is. The morning light is fresh and intense and I feel a sense of peace come over me. My mind is cleared and I see only the smiling, happy faces of my children – perfect innocence. I remember, then, my fathers words. Lives are lost in the fog. My father prepared me for that. On October 16th, 1997 the Robinson family, in deep cryogenic sleep, left the Earth aboard the Jupiter 2 – the first family in an effort to colonize Alpha Centari. 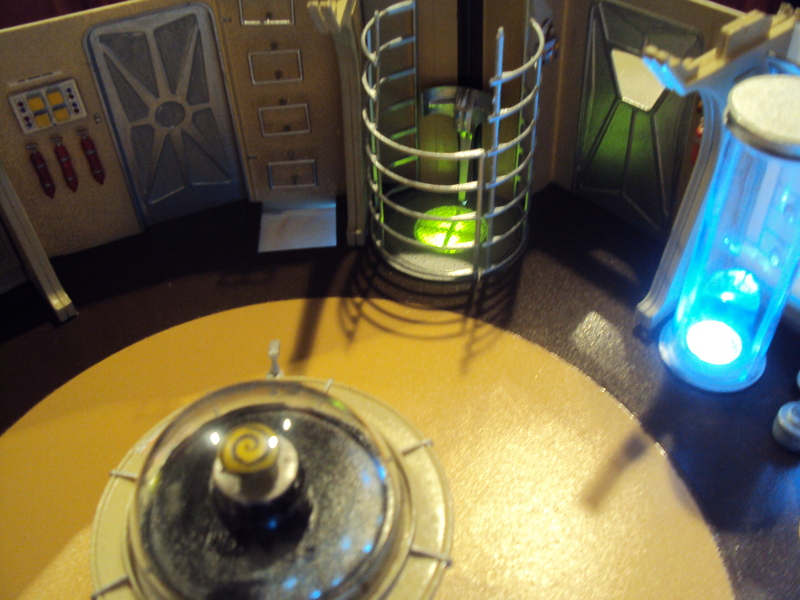 The victim of sabotage by an enemy agent, the damaged ship and its occupants were hopelessly lost in space. 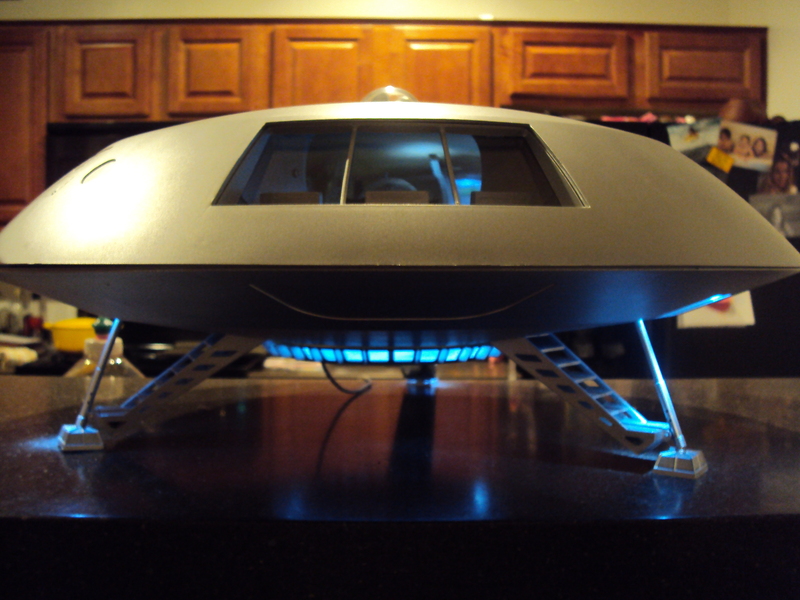 The Jupiter 2, shaped like a large flying saucer, would serve as the Robinson’s home as they tried to find their way back to Earth. 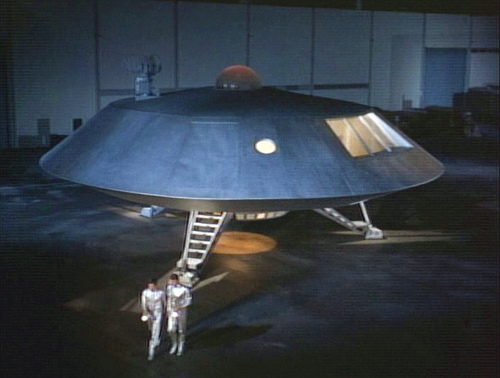 The 1960’s Irwin Allen series was a preemptive attempt to capture a science fiction audience before the imminent release of Gene Roddenberry’s Star Trek. Over the years, Lost in Space hasn’t held up as well as Star Trek due largely to its campy plots and monster of the week episodes, but it is still much loved for its iconic robot and the famous ship that captured the imaginations of boys like me. I am still nostalgic for those early adventures. Watching these old shows reminds me of the boy I once was, and the memories are fond and vivid. 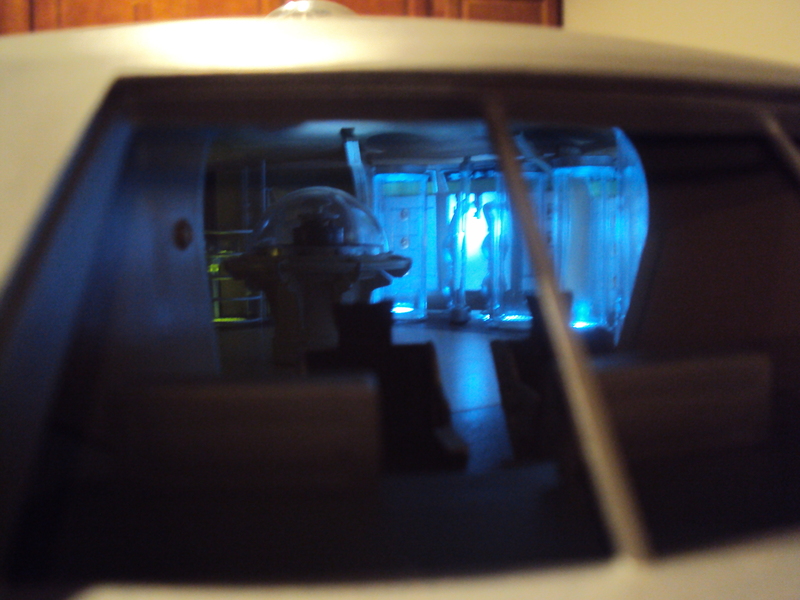 I recently added the Jupiter 2 to my collection of science fiction models and memorabilia. 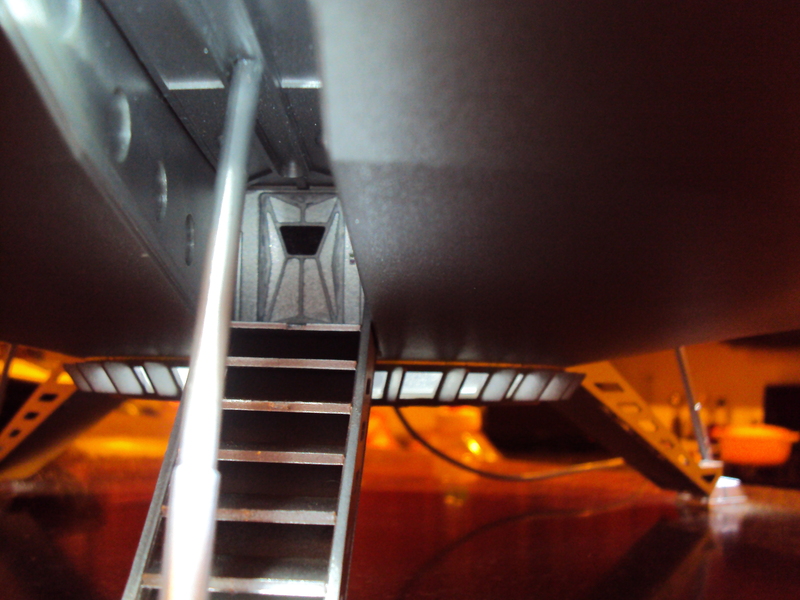 The Moebius Jupiter 2 is an impressive 18 inches across and highly detailed – far superior to earlier model versions of the ship. 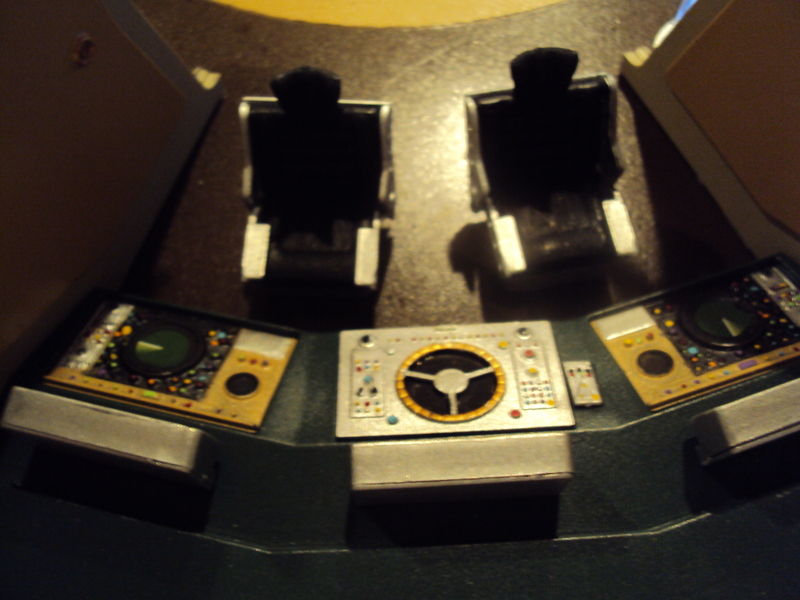 I found a professional modeler that built the ship for me and the craftsmanship far exceeded my expectations – and they were very high. 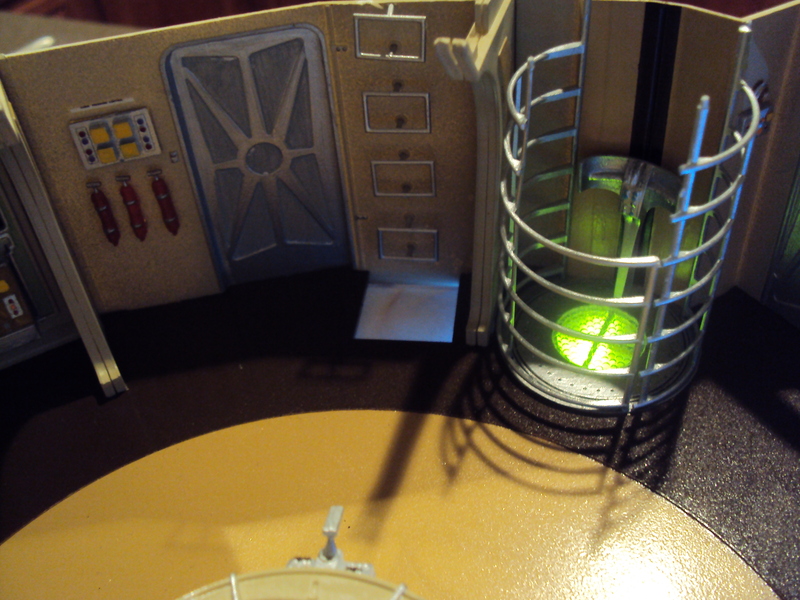 The modeler was able to install a custom lighting kit that really brings the ship to life. 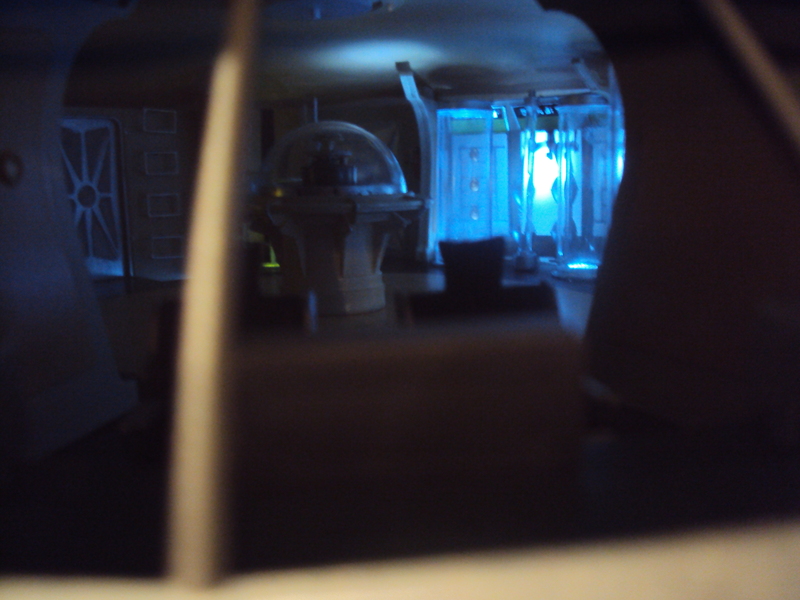 Each cryo-tube is individually lit as is the elevator shaft. Lights hidden between the panels of the ship bring each computer console to life. 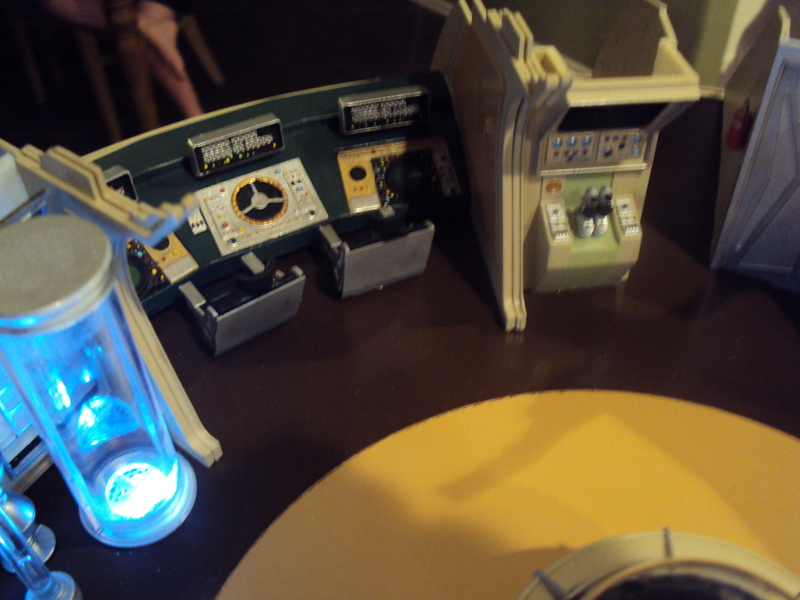 The landing gears and reactor core are also lit. The detailed painting of the consoles is perfect. Looking through the main window of the ship is like looking onto a movie set. The Jupiter 2 takes its place in my collection with other famous ships from late 60’s and 70’s science fiction shows including a 3 foot model of the USS Enterprise from the original Star Trek series, the Eagle One Transporter from Space 1999 and the Seaview from Voyage to the Bottom of the Sea. The following photos are of the actual model in my collection. If you are interested in one of these I can connect you with the artist. Keith Eubanks is a Professor of English at Monterey Peninsula College. He teaches composition and literature, collects rare books, loves movies and is an avid collector of science fiction memorabilia. He is surrounded by beautiful, intelligent women – the secret to his success.